Unlike the facial torsion model, which focuses exclusively on the "current utility" of the postorbital bar, a significant component of the NVPH is its dependence on the morphology of the sister taxon with which basal primates are compared (and thus the polarity of the ancestral condition from whence they arose - see also Dagosto, this volume). 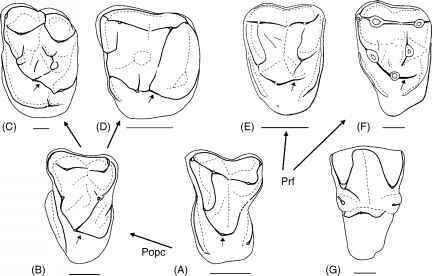 Due to certain basicranial, dental, and postcranial similarities with primates (Gingerich, 1976; Szalay, 1972), plesiadapiforms have figured heavily in this scenario (regardless of putative dermopteran affinities with this latter group - Beard, 1993; Kay et al., 1992). As they retain a primitive mammalian skull morphology, the use of plesiadapiforms as the sister taxon of primates allows one to relate derived changes in primate orbital form, postorbital bar formation, and encephalization to the evolution of nocturnal visual predation (Cartmill, 1970, 1972, 1974). Recent systematic analyses appear to provide further support for this phylogenetic hypothesis (Silcox, this volume; Springer et al., this volume). As dermo-pterans also exhibit low levels of orbital convergence and do not possess postorbital bars, suggestions that a clade with dermopterans and some plesi-adapiforms as the sister taxon to primates (Beard, 1993; Kay et al., 1992) would also pose no problem regarding the NVPH of primate circumorbital and orbital evolution. Several lines of evidence from the postcranium also appear to support the NVPH (Dagosto, 1988, this volume; Hamrick, 1998, 1999; Lemelin, 1999; Lemelin and Schmitt, this volume); however, the fossil data arguably suggest more arboreal grasping behaviors for the ancestor of modern primates (Bloch and Boyer, 2002, 2003; Bloch et al., this volume). Finally, if scandentians are the sister taxon to primates (Wible and Covert, 1987; Wible and Martin, 1993), certain aspects of the NVPH need to be reassessed—most important of which would be the link between postorbital bar development and increased orbital convergence and/or greater orbital frontation. If living tupaiids do approximate the condition of the ancestor to primates, then a postorbital bar clearly evolved prior to the split of scanden-tians and primates in a (presumably) diurnal, small-brained animal with low levels of orbital convergence and frontation.